An education will probably increase your lifetime earnings. Why not make that probability work for you? Or not. Teaching probability can be challenging because the mathematical formulas often are too abstract and complex for the students to fully grasp the underlying meaning and effect of the concepts. Games can provide a way to address this issue. For example, the game of roulette can be an exciting application for teaching probability concepts. 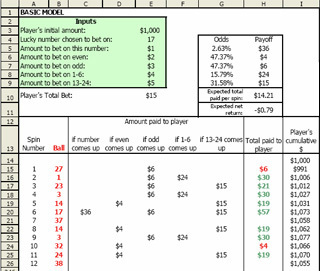 In this paper, we implement a model of roulette in a spreadsheet that can simulate outcomes of various betting strategies. The simulations can be analyzed to gain better insights into the corresponding probability structures. We use the model to simulate a particular betting strategy known as the bet-doubling, or Martingale, strategy. This strategy is quite popular and is often erroneously perceived as a winning strategy even though the probability analysis shows that such a perception is incorrect. The simulation allows us to present the true implications of such a strategy for a player with a limited betting budget and relate the results to the underlying theoretical probability structure. The overall validation of the model, its use for teaching, including its application to analyze other types of betting strategies are discussed. "An in-depth but easily readable guide on probability theory, covering various aspects of the theory with a bias to gambling games and strategies. Includes working examples in an excel spreadsheet."